The sweet aroma of mutton smoke drifts through a maze of crumbling alleyways, a barbecue tang that for decades has lured meat-eaters from across Pakistan to the frontier city of Peshawar. The ancient city, capital of northwestern Khyber Pakhtunkhwa province, has retained its reputation for some of Pakistan’s tastiest cuisine despite bearing the brunt of the country’s bloody war with militancy. University student Mohammad Fahad had long heard tales of Peshawar’s famed mutton. “Earlier we heard of Peshawar being a dangerous place,” he told AFP-but security has improved in recent years, and he finally made the hours-long journey from the eastern city of Lahore to see if it could live up to the hype. “We are here just to see what the secret to this barbecue is,” he says, excitedly awaiting his aromatic portion in Namak Mandi-“Salt Market”-located in the heart of Peshawar. The hearty cuisine comes from generations-old recipes emanating from the nearby Pashtun tribal lands along the border with Afghanistan. It is feted for its simplicity compared with the intricate curries and spicy dishes from Pakistan’s eastern plains and southern coast. “Its popularity is owed to the fact that it is mainly meat-based and that always goes down well across the country,” says Pakistani cookbook author Sumayya Usmani. The famed Nisar Charsi (hashish smoker) Tikka-named after its owner’s renowned habit-in Namak Mandi chalks up its decades of success to using very little in the way of spices. For its barbecue offerings, tikkas-cuts of meat-are generously salted and sandwiched on skewers between cubes of fat for tenderness and taste, and slow-cooked over a wood fire. Its other famed dish, karahi-or curry stew-is made with slices of mutton pan-cooked in heaped chunks of white fat carved from the sheep’s rump, along with sparing amounts of green chilli and tomatoes. Both plates are served with stacks of oven-fresh naan and bowls of fresh yogurt. “It is the best food in the entire world,” gushes co-owner Nasir Khan, adding that the restaurant sources some of the best meat in the country and serves customers from across Pakistan daily along with local regulars. By Khan’s calculations, the restaurant goes through hundreds of kilograms of meat a day-or about two dozen sheep-with hundreds if not thousands served. Orders generally take close to an hour to prepare, with customers quaffing tea and occasionally smoking hash ahead of the meal. “They smoke it openly here,” explained Nisar Charsi’s head chef Mukam Pathan. “When someone smokes one joint of hash, they eat around two kilos of meat.” For those looking for a little less lamb, the city’s renowned chapli kebab offers an alternative. The kebab is typically made of minced beef and a mix of spices kneaded into patties and deep fried on a simmering iron skillet. Rokhan Ullah-owner of Tory Kebab House-said the dish is most popular on cold, winter days that see ravenous customers flocking to its four branches across the city, overwhelming staff and making orders hard to fill. “They eat it with passion… because one enjoys hot food when the weather is cold,” explained Ullah, who plans to expand in major cities across Pakistan. Customer Muhib Ullah has been eating kebabs three to four days a week for the last decade. 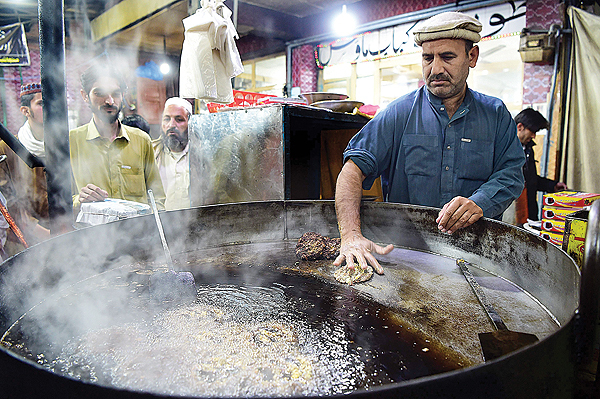 “This is the tastiest and most famous food in Peshawar,” he declared. For regular barbecue eater Omar Aamir Aziz, it is not just the heaping portions of meat that attract foodies to Peshawari cuisine, but the culture that has built up around the meal. Other cities in Pakistan and abroad have more in the way of entertainment and nightlife options. But in deeply conservative Peshawar, eating out is the primary leisure activity.